Premiere: Entrails - "Breath of Blood"
Entrails‘ origin story is a ray of hope if your chugs have yet to be laid to tape. You’ll record those riffs. You will. Remember, it’s worth waiting to do it right. Just don’t wait too long. Began in 1990, Sweden’s Entrails cobbled together some unsatisfying cuts that never saw the light of day. Then, as groups often do, Entrails broke up. Leader Jimmy Lundqvist went on to other things. But the itch to stomp on an HM-2 never diminished. Sometime around 2009, he joined forces with Jocke Svensson (Birdflesh, Skogen) and revived the old stuff in the form of a pair of demos, dusting tracks that collected over a decade of cobwebs. That got the ball rolling and, man, did it roll quickly. Those two demos led to three full-lengths, an expanded band, and a deal with Metal Blade. Nearly 25 years later, Entrails are in full stride, old enough to appreciate the success. 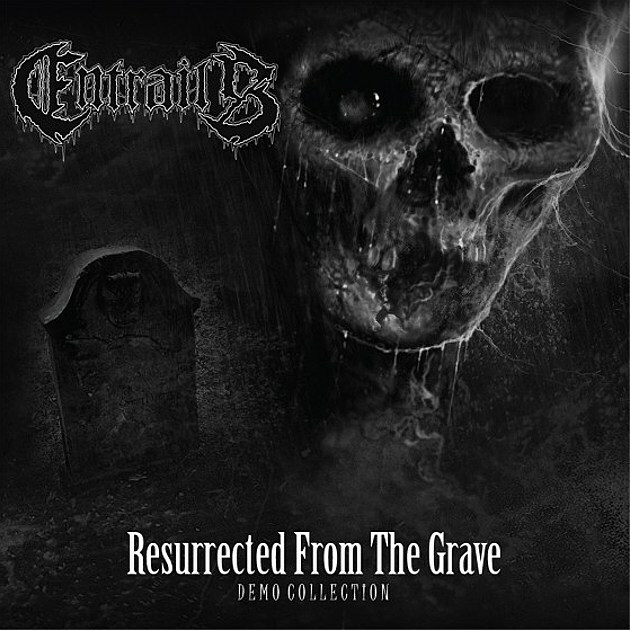 Resurrected from the Grave collects the two 2009 demos, Reborn and Human Decay. “Breath of Blood” is off the former and is a fine example of what you’ll find within Resurrected‘s walls of distortion. It’s the right vintage for this kind of death, composed before lumbering grooves were relegated to being a shade of paint for _______ n’ rollers. In other words, “Breath of Blood” is purer and unconcerned with trying to be a step ahead. It’s simply a nasty little death metal song. That said, there’s an inherent maturity present. “Breath of Blood” is whittled with an attention to detail and editing sense sharpened by experience and hindsight. For instance, if Swede death’s quality is tied to its tone, “Breath of Blood” passes inspection. Svensson and Lundqvist understood that, so their redux took extra care to sound like someone poured ball bearings down a running garbage disposal. However, here’s the best thing: below the flying shrapnel, “Breath of Blood” is dark. Not B-flick dark, but real life dark. “I know the time/When you grow up/Time has not changed/After your parents’ death,” Svensson grunts, going on to detail the emotional wound that never closes after your folks check out of existence. Damn. Gut punch. There are few things more frightening than recalibrating mortality. If there’s any reason to take refuge within the time-preserving properties of a recording booth, there it is. “Breath of Blood” appears on Entrails’ Resurrected from the Grave. The compilation will be released July 22 by Metal Blade Records and it’s available for preorder now.